Welcome. I have been working on my blog for only a few months, but if you are new to the blog, an introduction might be useful to you, before you start wandering through. Originally I wrote five days a week and those two months have a mix of creative exercises for poetry, posts on the theory and practice of poetry, and general posts on a variety of poetic topics. Now, Tuesday is the creative exercise day, Thursday is theory and practice, and Friday is a roundup of sites with prompts. The post below is the first post I wrote once I knew the direction I wanted Wordgathering to take. Way too early to be doing this, but I woke to the sound of water splashing on the street as cars tore by on the way to work and then I heard the steady thrum of rain. I got up to blackness and hurried out to see my trees. As I approached the porch doors a flash of lightning lit the skies and I saw my tree arms flailing, looking like a group of panicked swimmers whose boat had overturned, all their arms waving about madly as they tread water. The second tree was still, but mine swayed and flailed and waved. I moved closer and realised the bulk of my tree sheltered the other which stood lifting its arms to the rain. Mine continued to move like a mad thing. As the sky grew lighter I saw its leaves had curled in making themselves as small as possible against the battering of the rain. Now I am going to drink my coffee and come back later to talk about time and space and writing. Okay, first cup of coffee down, breakfast done, laundry on. The weather has calmed down. Now it’s grey and mizzly. This will be a short piece because Mondays are that way. But I want to address time and space. Time is a difficult issue, especially as writing involves energy. Most writers hold down a job and write when they can. A lot of writers are teachers because that allows more spare time, theoretically – there are the vacations. I taught English lit and comp for 19 years, which is also how long I have been writing. However, the energy required to teach that subject, along with a couple of other factors, led to my not writing for about three years. I retired from teaching to write, so I will be discovering time and how to allocate it in a whole new way. For those who are working, what is important is that you commit to an amount of time and write at the same hour each day you write. This doesn’t mean, should you be struck with an idea outside that timeframe, that you can’t write at any time, but you want to at least write for the designated time. And, give yourself time off – a day when you don’t sit down and write during the set time. You can also set a limit of producing a certain amount. This is easier for fiction writers who can say I will write 1000 words. Poets can elect to produce one draft of a poem per session. remember: it does not have to be good. That comes later with revision. The important thing is a writing routine. Because I don’t have the limitations of a job, I find routine a little harder. It’s easier to waffle around the time. I try to write Monday through Friday from about ten in the morning to about two in the afternoon. Those are my parameters, with the note that I am prepping supper and taking care of the flat also. I haven’t yet been good about sitting down and focusing, but that can be partly because I am still getting used to retirement, the new place, relearning how to do so much. Place. Place is important. Some people require a desk in a quiet room with all electronic interruptions turned off. Others can write with the phone ringing, children racing around, the television on and constant interruptions. Winston Churchill wrote naked, my uncle swears by his writing desk which is a standing desk. He stands to write. I am rather taken by the idea, but the desks are expensive. SARK writes on her bed, in crayon and felt tips. If you don’t know SARK, she’s worth a visit: http://www.planetsark.com/ I write in two places. Right now when I blog, I write sitting in my large comfortable desk chair at my computer with my keyboard in my lap. That’s also how I write once I move my poems from paper to computer. When I start a poem, or am revising it, working it, on paper, I sit in my huge plush recliner, often with the television on. I have my notebooks, pen, and whatever research I need spread around me. Sometimes, when I remember my arm needs support, I will use a lap desk. All conditions are to help you feel ready and able to write. Margo, I enjoyed this write up on time and space. Thanks for the link on SARK. I’m going to go check her out. 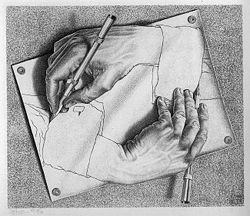 btw love the Escher, I’m a huge fan! Thank you, Pamela. Let me know what you think of SARK. I have several of her books. They are such fun. I’m a fan too, but this illustration is my favourite. Okay, I didn’t mean to laugh, Teri, but I had a vision of you flailing like my tree…I know you’ll understand :). I seem to have been curling up against the elements lately. I like that you have linked our actions to the tree. While deserts and oceans are my hold to nature, this tree has had quite an effect on me. Hello, I’ve just gotten onboard – so happy to find others like myself…loving words. I will check out the Sark address too since I bought one of her books long ago..still love it. I have my copy of Poemcrazy by Susan Goldsmith Wooldridge nearby all the time..I credit her for “planting the poetry seed” in me…met her when she came to Oakdale, California years ago when I lived in California. I’ve purchased several of the Poemcrazy books just to give away to those who are just getting started. I know I’ll enjoy learning and sharing on this site. Welcome, Savannah! So glad to have you onboard. I envy your meeting Wooldridge and love your idea of keeping copies of her book to hand out. I may start doing that, as it should be the basic of every poet’s library. Hope to see you around the site. Thanks for stopping by and choosing to like “Classified” – all the very best to you and yours for the coming season.